Adrian PA0RDA and I once bought a bunch of glass fibre masts with a length of 12.5 meters to do experiments with vertical antennas. 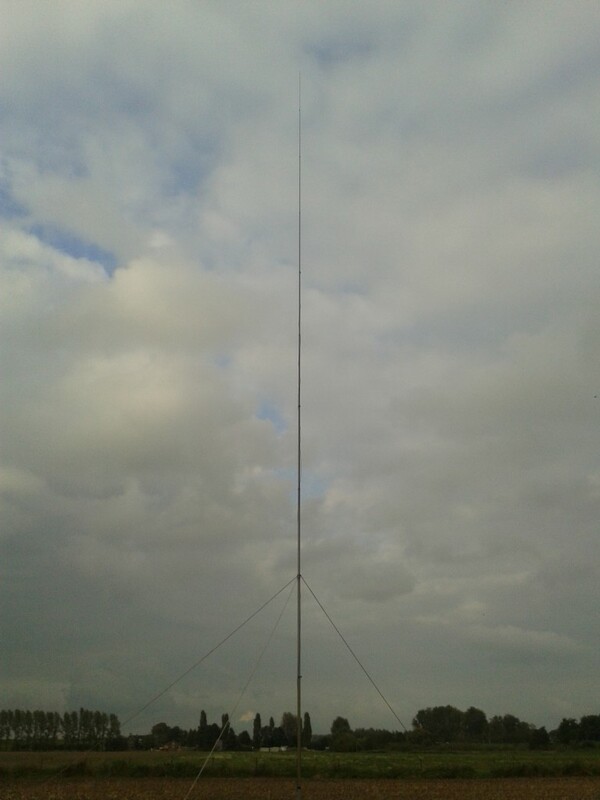 After a successful experiment with a 1/4 wave vertical for 40m we wanted to build a vertical for 20m too. 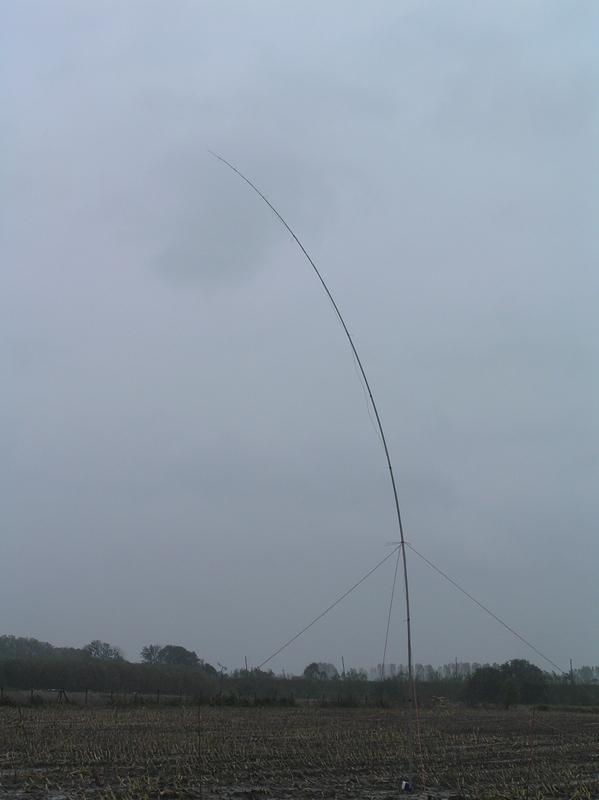 The fibre masts are just tall enough to hold a 5/8 vertical for 20m, the idea of building a 5/8 was born. After studying different types of verticals we concluded that the 5/8 would be the best vertical for our goal (international contesting and DX’ing). After building a 5/8 for 20m we compared received signals with a Hy-Gain AV-12AVQ (vertical for 10/15/20m, acts as a 1/4 wave for 20m). DX signals were in most cases just a bit stronger on the 5/8. More remarkable and not less important: the noise level was noticeably lower, probably due to the fact that the 5/8 is a monoband antenna and filters out more of the RF spectrum. Remember that an antenna is also your first filter/preselector! After several years of contesting the 20m band appears one of our most successful bands, with the 5/8 wave vertical antenna being a crucial part of this success. For 15m we have tried several types of vertical antennas, the last 2 years we used a J-pole antenna. But we were still not satisfied with this antenna and the contest results on this band, so improvement was needed by means of yet another antenna. Because of the positive results with the 5/8 for 20m we decided to build a 5/8 for 15m too. Vector diagram showing how the inductor matches the impedance of our 15m antenna. The red vector is the antenna impedance, green is the inductor impedance, and blue is the sum of both. The antenna impedance (R+jX) merely depends on the ground plane, but will be rather capacitive (negative X). To feed the antenna with 50 ohm coaxial cable, a match is required to transform the antenna impedance to 50 ohms (50+j0). We measured the impedance of our 15m antenna: 53-j328 ohm. So R=53, and X=-328. By adding an inductor with a value of +j328 the total X becomes 0 and the impedance will be 53 (+j0) ohms. This is close enough to 50 ohms, so just adding the inductor is enough to achieve a correct match. 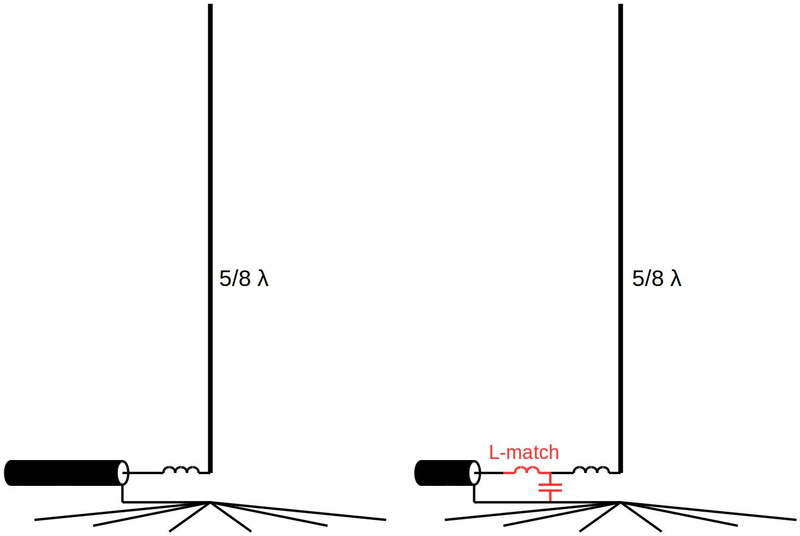 If your R is noticeably higher than 50 ohm, you may consider to add an L-match to transform your R to about 50 ohms. Lots of calculators (online and software) are available to determine the required values, for example here or here. Matching the antenna: left with just the inductor, right with an additional L-match to transform the real impedance. The vertical itself can be made of a piece of wire along a fibre mast. If you want a more solid solution that will hold for many years, you better get some aluminium pipes and hose clamps. Anyway, we use the wire-along-the-mast. When cutting the wire, be sure to add some extra length. The ground plane depends on your soil, in wet mud a simple ground pin will probably do the job. But in most cases you want some radials to create an artificial ground, independent of weather and ground conditions. The length of the radials is not critical, different sources advise a minimum length of 0.3 wavelength. For our 15 and 20m verticals we applied 16 radials for each antenna, each radial being about 6 meters long. 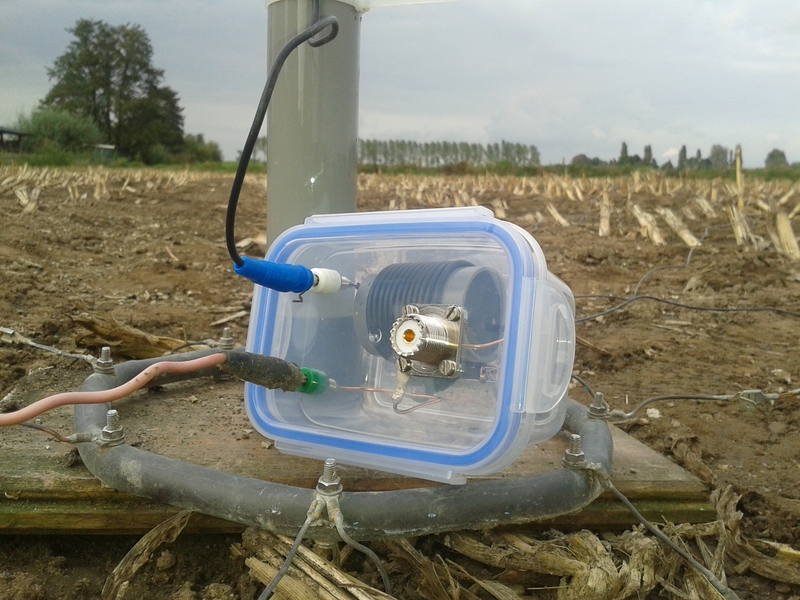 When the antenna is erected and the ground plane is in place, grab your antenna analyzer or VNA. Find the (lowest) frequency for which you have minimum return loss. For this frequency the vertical is 1/4 wavelength. To determine the frequency for which this length is 5/8 wavelength, multiply the frequency by 2.5. This is the operating frequency. Since your wire should be a bit too long, cut away some cm’s and measure again. Repeat this until the system has the correct size. Again, grab your antenna analyzer of VNA and measure the antenna’s complex impedance (R+jX). Determine the value of the series inductor (and optionally the L and C of the L-match) as described above. The match is build into a small waterproof box, we used a box that was originally meant to put food into your freezer. A SO239 connector and 2 female 4mm connectors are placed in the lid, the components are fixed to these connectors. The coil is made using a piece of PVC pipe with a hole drilled on each end to hold the wire in place. Use a LC-meter to be sure you have the correct inductance. When including the L-match, use a ceramic high-voltage type capacitor, capable to handle the RF power. Matchbox of our 15m antenna, this one just needed an inductor to get the right impedance. 12.5 meter fibre mast by DX-Wire, secured with PVC tape. Copper wire with PVC shield, normally used for electrical wiring, 1.5 mm2 (AWG #15). Here in the Netherlands it’s called “VD draad”, this wire has a velocity factor of 0.92. Tie-wraps to mount the wire to the mast. 15mm copper pipe with 30cm wire attached, female spade connector soldered at the loose end of the wire. 16 radials, each made of 6 meters WD-1/TT wire (originally used by the army for field telephony), provided with female spade connectors. Copper pipe, bended in a circular shape, used to combine all radials. Copper wires are attached to this circle, with male spade connectors soldered at the end. Plastic box, normally used for putting food in the freezer. Small piece of PVC pipe to hold the inductor. Some more copper wire to wind the inductor. Optionally: high voltage capacitor, large enough to handle the power. Our 5/8 vertical for the 15m band. The mast is 12.5 meters tall, however just the first 8 meters from the ground are used for this vertical. Great article and inspiration. Please ad some more detailed pictures on your site. Great article and thank you sharing. There is little difference between a 0.64 wave and a 5/8 wave, 5/8= 0.625. Actually for 27.555 Mhz .. I anybody is reading this in the future – please feel free to email and advise .. I read 21’5″ is the best overall length to use for 11meter 5/8 wavelength aluminum vertical antenna when tuned at 27.185mHz. You won’t see any difference in gain/performance with any other length to 23′. Could you add construction details and specifications for the matching inductor and capacitor? Joe, my article explains how to calculate the series inductor for the antenna. The scope of the article does not include an explanation for how to calculate the L-match, but you can find lots of information and online calculators on the internet.